Realogics Sotheby’s International Realty recently released a special report on resale condominiums in downtown Seattle to explore the current state of the market and forecast what’s ahead. In the first half of 2018, there were many more resale condominium listings available for sale than in recent past and sales activity remained stable on a year-over-year basis. A look at market data reveals a 20-percent increase in the average price per square foot for downtown Seattle condos—from $726 in 2017 to $826 in 2018—despite other large metropolitan cities in the U.S. and Canada reporting lulls in market demand and falling sales prices. So, what makes Seattle different? When it comes to condominium development, Seattle is truly an exception to the rule. 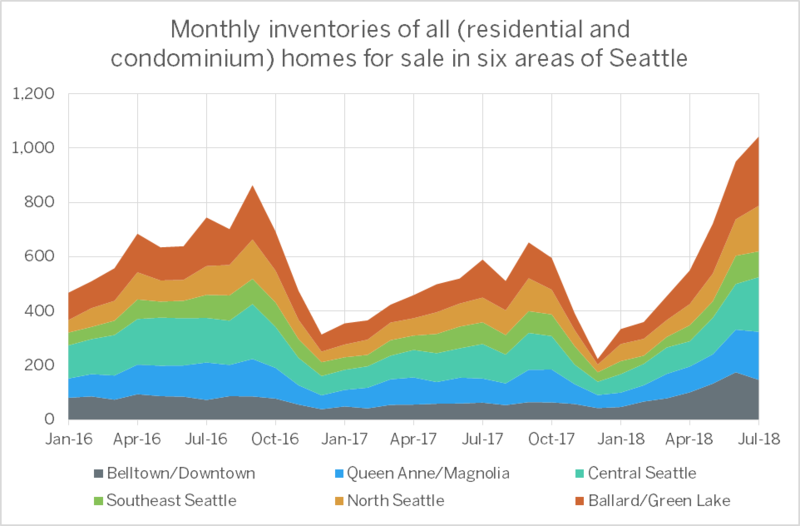 Above: Inventory patterns in Seattle tend to follow a cyclical pattern of growing supply in the fall that declines by winter. 2018 exhibits a more expanded outlook, following an especially anemic winter sales season. According to RSIR, one reason Seattle’s market differs is that it has a lot of catching up to do; consider that there were no new condominiums delivered in 2017 and that new projects in the pipeline have drawn large crowds and large volumes of unit reservations and presales. The 389-unit NEXUS condominium tower, which is slated for completion in late 2019 recently announced the commencement of presales following a 92-percent presold status. Closely behind, KODA Condominiums, which is scheduled for first occupancy in mid-2020, is already 95-percent reserved. Belltown and the downtown Seattle region have especially reaped the bounty of new condominium development, as Amazon and other regional employers have drawn waves of well-qualified buyers to the area. In 2018 Q2, seven condos in the area were sold at prices above $2-million; five sold between $1.5- and $2-million; and eleven from $1.25- to $1.5-million.